Here at Gray Chrysler Dodge Jeep Ram, we study our trucks carefully so that our consumers have detailed information about our models. If you are looking for a light-duty pickup truck, we suggest the Ram 1500. This is a popular model because it offers an abundance of features that enhance capability. With the 1500, the standard engine is the 3.6L Pentastar V6 engine with eTorque. This engine provides you with best-in-class horsepower and has a maximum towing capacity of 7,730 pounds. This engine can reach 305 horsepower and 269 lb.-ft. of torque, and it offers best-in-class 4x4 fuel economy and best-in-class 4x4 driving range. The available engine with the 1500 is the 5.7L HEMI V8 engine, which can be paired with eTorque. This engine can deliver 395 horsepower and 410 lb.-ft. of torque. 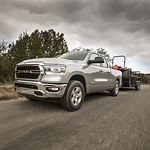 If you choose to equip the 5.7L HEMI engine with eTorque, you get best-in-class V8 towing of 12,750 pounds.